If you need tips to paint a room like a pro and how to paint a room fast, you’ve come to the right place! This trick will save you time, money, and a mess! You would think painting an 800-ish square foot home would go rather quickly. But guess what? It didn’t. At least not the first and second time I painted it. The first time around was yellow. Not a creamy butter yellow, but more of a diluted highlighter yellow with a tinge of grey yellow. That ‘French Cottage gone Wrong’ look lasted about a year, which was far too short for the agony we endured painting with tape, those fancy edgers, and a roller and tray. The next time we painted, it was a medium shade of neutral grey which I actually liked up against the bright white 60-yr old trim and 6 foot windows. That’s the time I got paint in my contact lens, cut in with a brush, only used the edger on the ceiling in the stairwell that’s 10 feet high, but it took a lot less time to finish and my contact lens was fine. But this time, y’all. This time we decided to paint a room…well, the house, is efficient. We are selling this 800-ish square foot house, and have to paint the whole thing quickly and beautifully and basically, perfectly. While I’ve painted my fair share of bedrooms, playrooms, and this little house, I have grown to use the same supplies over and over – with one exception I just learned about. By the way, this post contains a few affiliate links for your convenience. Read my full disclosure here! a ladder *I used the edger on the pole, and it looks awful. Up the ladder, I shall go! In full disclosure, I will tell you this is only the second time I’ve ever painted ceilings, mostly out of avoidance. The first time, was when I just had to have those glow in the dark stars on my ceiling as a kid. When I outgrew them, I peeled them off along with the ceiling paint… my mom was so stoked on that. It was then, that I learned the order in which we paint: ceilings, walls, then trim. In the Brick House (the rental property made of bricks, as named by our then-3yr old), we removed the popcorn ceilings on the first floor and drywalled the 2 bedroom ceilings, so I had to paint the ceilings for the third time in my life. Third time is the charm, because they look great! After the ceilings were done, we broke out the EZ Twist Paint Stick from HomeRight, which they graciously provided me to try, instead of the typical roller and tray. Excitement level: Maximum. I asked a professional painter years ago tips on how to paint a room like a professional, and he said to cut in with a brush, and prep is key. 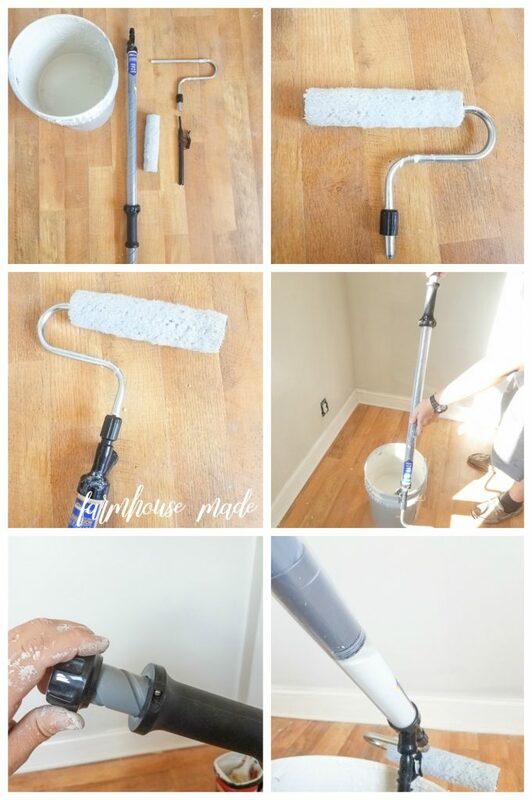 I’ve learned to take my time with practice, and cut-in with a great quality brush, and put in the prep-effort – cleaning, caulking, supply organization. I will use my painters tape against wood that I don’t want paint on, as well as the baseboard trim, because that low angle isn’t in my wheelhouse! Time spent prepping well, is time saved. These walls… I have seen the light, y’all. The light of not being held down by a paint tray, sore hands, and roller covers that slide off from pressing too hard, and pressing too hard because one more trip to the paint tray is just enough to send you over the edge. 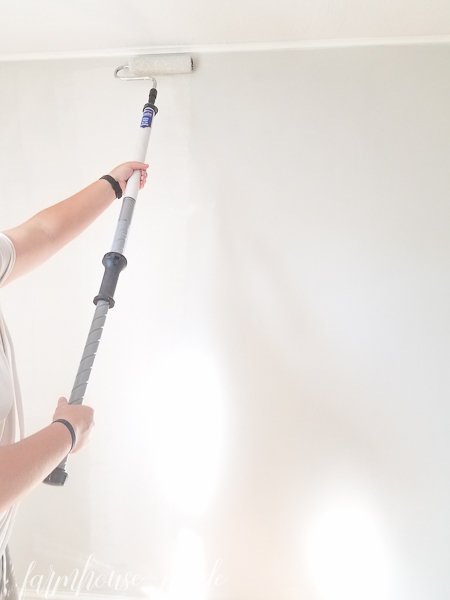 The HomeRight EZ Twist Paint Stick is a time saver. It’s the trips to the tray saver. It’s the drips all over the floor from the walk to the wall from the tray saver. It’s the hand saver. Using this is so very simple. Once I got the hang of how much paint to twist out, I was done the living room and kitchen in no time, with one coat. No splatters, no drips, just paint where it belonged. We did the bedrooms also, but it was getting dark, so I missed a lot of areas. We did some touch-ups, and they were perfection, you can see this action on my FB Live – we also discuss sticky buns if you’re interested in that. My other tip, which I should follow more often and always regret, is to not be stingy with paint, whether you’re using a roller or a paint stick. If there’s not enough paint, you’ll be pushing too hard, and need to touch up those areas. 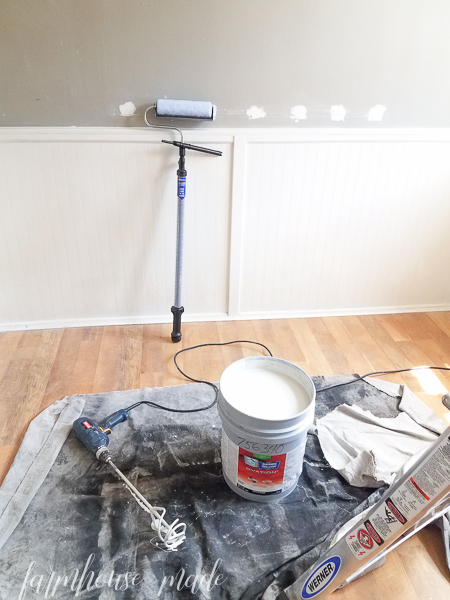 Eliminating all the trips to the tray is a huge time saver whether you’re painting a single room, or a whole house. The clean up is a little more time with rinsing the parts out, but it’s not labor intensive, and I’d rather spend time doing that, than cleaning and scrubbing all the drips and being a slave to the paint tray. Now that the Brick House is mostly done, after it sells, I’ll be gearing up to paint the Farmhouse, and you know I’ll be using the EZ Twist because I don’t want to deal with paint in my contact lens again, or being a slave to the tray! Wooohoooo!!!!! I love how fast the paint stick paints rooms – and HOUSES!!! It looks amazing and I know it’ll sell fast!! Rock on girlie!! That paint stick looks awesome I need one. I have so many paint jobs in my house that I have been putting. Off. I New paint gadget maybe the incentive I need to start. My most hated part about painting is the cutting in! And I have started painting the ceilings the same color as the walls to avoid my infamous dots on the ceilings, lol! Although it does make the room look larger too 😉 Rock on sticky buns!! I’ve been procrastinating on re-painting our master bath, ’cause, it’s paint, it’s a mess and I need to jerry rig a ladder in my bathtub to reach the wall. May need to check into getting a paint stick and finally get rid of those rose walls! Kim you are hilarious. I had missed the FB live and caught it here. I def need a paint stick!